Consigue de forma segura, rápida y al mejor precio el fantástico Monster High Y7715 - Cuarto de baño por Monster High. The Ghouls de Monster High each have their Beautifying rutinas to ensure They Always look Fierce. Lagoona Blue cleans up nicely in her Shower. that celebrates her Watery ancestry with a Seashell base, Jellyfish Showerhead, tentacle Piping and shower curtain printed with a Haunted Sea. The faucet Handle Swivels and a Small tubo is perfect for Her Pet Neptuna. to wash Off The land' S Grime. 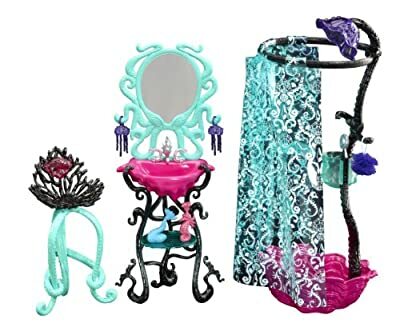 Once watered, Lagoona can sit in the Black coral neceser piel (with sea-sational Tentacle legs) to put on her Monster Face in front of the Octopus Mirror. 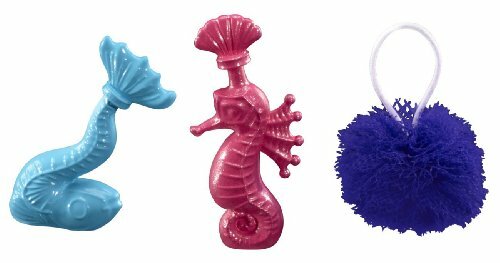 Accessories include a Seahorse Shampoo bottle, Fishbone deep-sea Scrub Bottle and a loofa. Warning. Not adecuado para niños under 3 years.